Thank you for your interest in the NRA Instructor Training Program. The goal of this program is to develop instructors to teach NRA Basic Firearm Training Courses according to the lesson plans and training standards of the National Rifle Association. This program is not designed to prepare you to teach other firearm training courses (such as law enforcement, security, or hunter safety courses), nor to prepare you to develop firearm training courses of your own. The NRA Instructor Training Course is designed to teach you how to teach others to shoot using NRA lesson plans and training methods. The course is not designed to improve your shooting skills. Possession of basic firearm safety and/or shooting skills is a prerequisite for certification as an NRA instructor. You may be asked to demonstrate your firearm background through participation in pre-course assessment exercises. We highly suggest enrolling in the student level course before instructor training even when it is not a prerequisite. A complete NRA Instructor Training Course consists of two parts. The first is basic instructor training, which consists of 6 hours of instruction. The second part is discipline-specific instructor training, which consists of an additional 5 to 14 hours of instruction per discipline. For example, an NRA Instructor Training Course in rifle, pistol, and shotgun lasts at least 40 hours. During the NRA Instructor Training Course, you will receive from your Training Counselor the NRA Trainer’s Guide, the appropriate NRA Instructor Candidate Packet which includes the course outlines and lesson plans for the disciplines you wish to teach, the appropriate NRA basic course student packet which includes the handbook, certificates, NRA Gun Safety Rules brochure and other materials used in NRA basic courses. The NRA Training Counselor who conducts your course will make a recommendation to NRA concerning your certification based on an evaluation of your knowledge, skills, and attitude. You will be asked to demonstrate your organizational and teaching skills through participation in several practical exercises during the course of your training. You will also be asked to complete an instructor certification examination. A minimum score of 90 percent is required for certified instructor applicants (85 percent for assistant and apprentice instructor applicants). 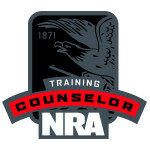 However, attendance at the course, or a passing grade on the examination, does not guarantee that you will receive the recommendation of the NRA Training Counselor. Instructor certification is valid for one year upon initial certification. After completion of the first year, instructors may renew their instructor credentials for up to three years at a time. NRA encourages instructors to remain active and would like to see at least one basic course taught per year. NRA Assistant Instructors are individuals 18 years of age or older who assist certified instructors to gain the knowledge and experience needed to become certified instructors. Assistant instructors must complete the same instructor level course. The Assistant Instructor ratings are available in six disciplines (Pistol, Rifle, Shotgun, and Muzzleloading Pistol, Muzzleloading Rifle, and Muzzleloading Shotgun). 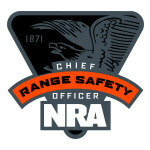 There are no Assistant Instructor ratings for Home Firearm Safety, or the Personal Protection and Reloading disciplines. NRA Apprentice Instructors are young people 13 to 17 years old who wish to understudy a certified instructor. An NRA Certified Instructor will choose the apprentice instructor from select individuals. These individuals must possess the emotional maturity necessary to handle such a position. In addition, they must attend and successfully complete the appropriate NRA Basic Firearm Training Course prior to attending an NRA Instructor Training Course. Apprentice instructor ratings are available in the three disciplines of rifle, pistol, and shotgun. There are no Apprentice Instructor ratings for Home Firearm Safety, Personal Protection, Muzzleloading, or Reloading disciplines.